Japanese Kanji Made Easy is designed to teach some of the most fundamental kanji characters, which are notoriously difficult for learners. It provides fun and memorable illustrations in its depiction of each kanji character, coupled with an explanation that includes just the right amount of useful information. It's an excellent investment for any Japanese learner, especially those who are beginners to the complex Japanese writing system. Japanese Kanji Made Easy: even the title is a bold claim. The writing system of Japanese is notoriously complex, largely because of its enormous set of kanji characters. Kanji, which is of Chinese origin, are complex characters which require many strokes and can only be learned by rote memorization. And worst of all, there are literally thousands of Kanji -- it’s estimated that there are around 50,000 in total (though to read a newspaper, you only need to recognize a mere 2,000). Especially for native English speakers who are used to a 26-character alphabet, the concept of memorizing thousands of kanji characters can be daunting, to say the least. Enter Japanese Kanji Made Easy. Its author, Michael L. Kuemper, has been teaching Japanese for over 20 years, and is well aware of the challenge that kanji presents to learners. As such, he provides clear illustrations, helpful memory strategies, and useful information that will take the headache out of learning kanji. Japanese Kanji Made Easy covers 1,000 of the most common kanji characters, so by the time you’re done, you’ll have established a solid foundation (and be able to read half a newspaper! ), as well as learned some key patterns that will make future learning easier. In order to help you memorize each character, Japanese Kanji Made Easy uses pictorial mnemonics, giving each kanji character an illustration that depicts something relevant to its meaning. 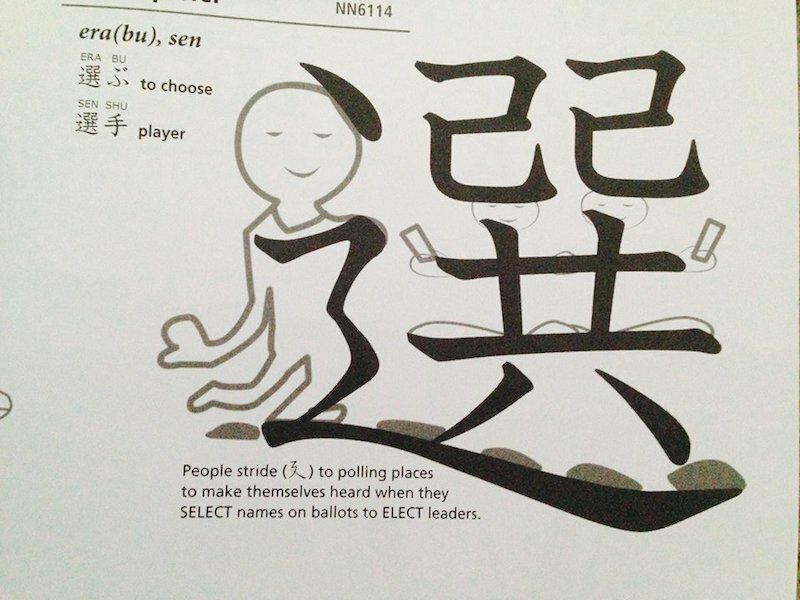 Often times, these illustrations tell a brief and charming story; for example, the illustration for the character that means select/elect is as follows: People stride to polling places to make themselves heard when they SELECT names on ballots to ELECT leaders (see below). This creates vivid imagery which immediately springs to mind when you try to recall the characters later. Thus, in addition to being entertaining -- reading stories is much more fun than memorizing standalone characters on a page -- the illustrations serve as an effective memorization strategy. Given that kanji characters often represent entire concepts, it’s easy to get bogged down by details. Japanese Kanji Made Easy avoids this pitfall, providing just the right amount of information on every character. Each kanji character comes with the following information: the kanji itself, the primary English translation(s), the number of strokes needed to write it, common pronunciations of the kanji (in Roman characters), sample vocabulary words that use that particular kanji. It also includes the kanji’s reference number in the New Nelson Japanese-English Character Dictionary (which is a staple in any Japanese learner’s bookshelf). As you can see in the above picture. every illustration comes with a short anecdote which is thematically relevant to the meaning of the kanji. Given that kanji characters often contain radicals -- smaller, consistent elements that can appear in a single kanji -- these are noted when applicable. Ultimately, what’s presented is informative without being overwhelming; it’s a perfect guide to aid basic understanding and memorization of some of the most common kanji characters. Finally, the book comes with an audio CD, which provides the common pronunciations of each kanji character. Therefore, you can listen while you study; this integration of visual and audio components is, in my experience, the best way to make new words really stick in your memory. Best of all, the CD is completely free! As an added bonus, Japanese Kanji Made Easy even contains detailed information about hiragana and katakana, the two other Japanese writing systems. Therefore, it’s truly an all-in-one comprehensive guide to the complicated Japanese writing systems. Note that, as mentioned above, there are thousands of kanji. The purpose of Japanese Kanji Made Easy is not to give the reader a detailed account of every kanji in existence, but rather to serve as a solid introduction to the most common characters. Therefore, it’s best suited to learners at a beginner to intermediate level, as advanced students of Japanese will already be familiar with most of the characters. 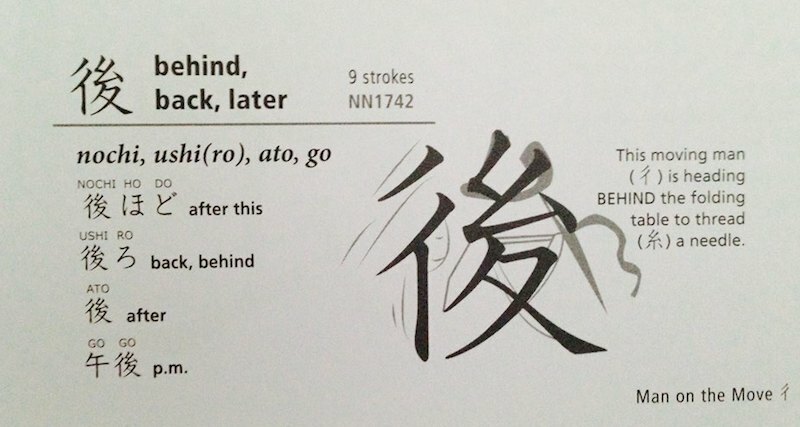 Ultimately, Japanese Kanji Made Easy lives up to its promise: by transforming each character into a relevant and simple illustration, it makes the process of memorizing kanji much less intimidating. It’s an excellent book for acquainting yourself with the writing systems of Japanese, and will pave the way for your future Japanese-language endeavors.